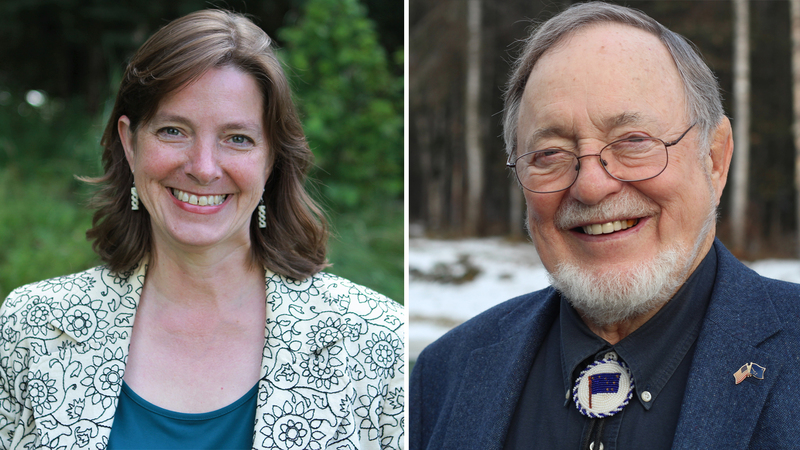 Testy moments punctuated “Debate for the State” Friday night, when Congressman Don Young and independent challenger Alyse Galvin faced off. One thing the candidates agreed on: American politics has become too hostile. Galvin said she’d model civility in Congress. Galvin, 53, is a first-time candidate who is on the ballot as the Democratic nominee. Young, 85, is the most senior member of Congress. He’s been in office since 1973. He said he continues to work well with Democrats, despite the tenor of the times. Young often points to his score on the Lugar Index of Bipartisanship, which examines party affiliation in the sponsorship of bills. Young is in the top 10 percent in the most recent ranking. Young and Galvin clearly differ on climate change. “We’re warming up, and I do not believe that man is the cause. It’s being used as an instrument to frighten people,” Young said. Galvin drew the contrast: “Unlike my opponent, I agree with the 99.5 percent of scientists who say climate change is absolutely related to human activity,” she said. Galvin said she’d consider a carbon tax as a way to reduce emissions. Young said he’d oppose a carbon tax, which he said would transfer the problem and allow someone to make money off of it. The testiest exchange of the night was between Young and one of the panelists. It came just eight minutes in, after Young talked about the caravan of Central Americans walking north through Mexico. Channel 2 News reporter Rich Mauer asked about Young’s use of the term. Young said he meant it in the sense of “the big one” and nothing more. Still, Galvin seized the opportunity to bring up a different term Young used, five years ago. Young apologized in 2013 for using that word, within days of the event. Galvin had her own trouble with terms during the debate. She repeatedly referred to “cutters” when she apparently meant “icebreakers,” which are a particular type of Coast Guard cutter. The debate was a co-production of KTUU-Channel 2 News and Alaska Public Media.